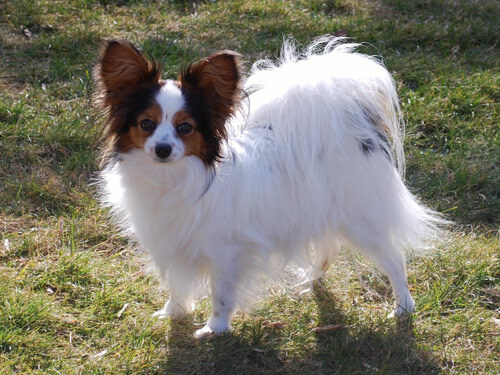 The Papillion is extremely obedient and very easily trained breed out of almost every single other breed. It is not as stubborn as other dogs, and loves to learn new tricks. Its mental capacity is pretty large despite its small-sized head. This breed is very gentle, friendly and loves to get attention from everybody. It is also very playful and somewhat curious by nature. If children are around the Papillion it becomes excited and loves to play. However, make sure you monitor children playing with this peanut-sized pup because it can be harmed easily by a child playing too roughly. The Papillion main source of upkeep is mental stimulation. Of course, physical exertion is required as well to ensure it remains healthy, but if it is not mentally stimulated on a daily basis, its mind will become restless and possibly disruptive. Fun and challenging games are the best way to exercise this breed, although walks will also do its body good. Its coat is long and requires frequent brushing to avoid tangles and to avoid its fur matting up into clumps. Wide-toothed combs are suggested for getting out the knots, and regular brushes are recommended once the fur is smooth. The brush will be sure to grab loose hairs and dead skin and remove them from this dog’s fur. Health concerns of this breed fall in the minor category. Typically when dealing with a smaller breed, the health concerns become more minimal. Larger dog breeds typically have more serious, or major, health concerns. Some possible conditions that are occasionally seen with this breed include vWD, PRA, intervertebral disk disease, and even allergies. Humans aren’t the only ones who get allergies. If you notice excessive sneezing or sniffling from your pet, it may be a case of allergies and should be taken to a vet. Other minor concerns include patellar luxation and dental problems. Make sure you brush your dogs teeth occasionally to keep doggy gingivitis from settling into its gums. It should be tested regularly for knee and eye issues. If kept healthy and monitored correctly, your Papillion can live up to 15 years old. The word Papillion literally means the word “butterfly” in French. This dog was named Papillion, or “butterfly,” because of its face and ears; they somewhat resemble the body and the wings of a butterfly. It was even once called the Squirrel Spaniel because of the way it carried it tail above its back, just as a squirrel does. When this breed was initially bred, their ears drooped and did not stand up straight; however, through generations of breeding, their ears suddenly became erect and there are no records pinpointing the reason for this or when it happened. This breed initially swept popularity polls in the 16th century in Europe. With time, Spain and Italy began to breed these dwarf-sized dogs, and they become the breeding and trading point for the breed. Royalty also became fans of this tiny breed, including Louis XIV of France, because of their great companionship and ability to fight right in their owner’s lap.